Budapest, Hungary Private Bus - MiniVan Service / Transfers. Sightseeing - detailed description: Bicycle Tour, Routes. Providing charter and shuttle transportation for all of Hungary. Cycling in Hungary as a recreation or a sport is a special pleasure. On your individual bicycle tour in Hungary, you can follow the unbeaten paths, discover hidden historical relics, unique cultural values and natural beauty of Hungary. The not-too-hilly, beautiful countryside of Hungary offers attractive routes across romantic little villages where foreign visitors are still something of a rarity. On the daily trips you can see not only beautiful landscapes, but also landmarks of thousand years old country. As you roam the woods, meadows and alkaline or sandy steppes, with the wind in you face and the fresh air in your lungs you can observe the wonderful flora and fauna at close quarters. In the first part of this easy, flat country tour the route is along the Austrian border, away from Szigetköz. Along the unfrequented roads of the Moson flatland you pass the Hánság and come back to Alsó – Szigetköz (Dunaszeg) from where a cycling track leads to Győr. In the vinicity of the Rábca lock and along the dike this track is a madeup dirt road as far as Győr (40 km). Most of the area is part of the Fertő – Hanság National Park. Besides the ecological interest you can see unique examples of restored ecclesiastic and folk architecture – the beautiful little church of Albertkázmérpuszta, the monumental cathedral in Romanesque style of Lébény or the village museum at Jánossomorja. The bike friendly track is provided with signposts all the way. You can cycle around the Balaton on the recently opened bicycle road. You may take the shorter bicycle trips through the forest or the small villages with ravishing location, or may pedal more kilometres away. Taking a leisurely cycle tour round Hungary´s sea is for many a memorable life experience. This is recommended particularly to small groups and to families with young children. You can take your bikes to the Balaton by train. The trip around the lake can be combined with a number of other programmes – swimming, surfing, sailing, mountain climbing, horse – riding, tennis, sightseeing, attending cultural events. The route along Hungary´s western borders sout of Fertő lake is a favourite of cyclists. Both mountain and flat – terrain bikers will find suitable sections along this track. The route is along a designated cycling track round Fertőlake, except for the section between Fertőrákos and Balf. Sights of particular importance are Sopron, the Fertőrákos quarry, castle at Nagycsenk and the Eszterházy castle – the Hungarian Versailles. On this tour of moderate difficulty on varied terrain with many sights, caution is recommended on account of the seasonally increasing traffic. Írott – kő is the highest peak (900 m) of the hills south of Kőszeg. At the foot of the mountains the route follows a marked bike – friendly track with little traffic. It is recommended to make a walk in the natural park and the row of cellars at Cák. It is worth stopping at Velem, where small folk crafts are displayed and a fair is held occasionally. On the road before Szombathely heavier traffic may be reckoned with. Leaving Szombathely, the largest and most bike – friendly town of the region, you can ride along the marked cycling track Vashegy, a pubilc road with slight traffic and slope. The traffic becames heavier close to Szombathely and Ják. You cross the main road No. 8 at several places (Kőrmend, Csákánydoroszló, Rátót) where caution is recommended. These sections are parts of the excursion cycling route marked with Őrség signboards, bordering on Austria and Slovenia. The Sub – Alpine climate here is rich in precipitation thanks to the closeness of the Alps and the Adriatic. In this region the old settlements of the szer type have survived. You proceed among monuments of folk architecture on good – quality roads with gentle slopes. Hungary has more than 2,000 kilometres of cycle track. Cycling is now permitted in hilly and woodland regions as well, including national parks. Cyclists must keep to marked routes. The blue line represents the region's main route ('the route of kings') which is suitable for all cyclists. The red line practically follows the blue line, but this route is expanded to attract those with mountain bikes looking for more challenging, more spectacular scenes. The green lines represent routes connected to the main route, regardless of their level of difficulty. The different routes are represented by logos or direction signs. Most of the bicycle tourists travel in pairs, then families, and in a growing number in larger groups of 6 persons or more. If you cycle on the bicycle route on the pavement, you must ride at a proper low speed and use the bell if necessery so that pedestrians are safe. If you cycle on the road, it is advisable to be decisive and clear in your intensions. If your destination is relatively far, you may consider approaching by train. Most trains of the Hungarian State Railways have a bicycle transport carriage, or bikes can at least be transported on the platforms of the carriages. It is indicated by a little sign in the railway timetable. The tariff is a bicycle ticket and the railway company does not take responsability for the bike. Bikes can be posted as luggage as well. As far as local trains are concerned, one bicycle can be transported on each platform. It is advisable to use different types of bicycle for different roads. Even the simplest bicycle will do on flat terrain, but you will need a mountain bike or a bike with tyres suitable for difficult terrain if you want to ride on dirt roads. If the area is hilly, a multi – gear bike is necessary, and if you want to ride in difficult mountain areas, it is advisable to set on a special multi – gear mountain bike. If you cycle in the national parks, you can only cycle on the marked or recommended routes. Never cycle on dirt roads and dams/dikes in rainy weather. The current effective Hungarian laws do not allow cycling in the forests except on the marked routes. You need a special permit to ride on forest roads until they are properly marked for bicycle routes. Never harm nature when you are on a bike tour. Always preserve its beauty. You must never forget that your health largely depends on the integrity of our natural enviroment. The most pleasant weather for bike tours is in May and September if it is not raining. There is low traffic in the vinicity of the famous sights off – season, therefore you can then ride safely and conveniently. 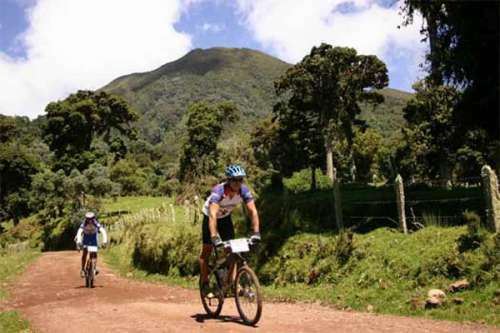 When planning a bike tour, always use bike maps and guidesbooks offering routes that avoid dangerous, busy roads and are updated with all bicycle roads, the so called bike – friendly roads indicated by a bike sing, forest roads, dikes and low – traffic roads. Bike maps and guidebooks are available at bookshops and in bigger bicycle shops.